David Accam (right) had 14 goals and eight assists for the Chicago Fire in 2017. The Union on Friday finally made the kind of big acquisition they've promised all winter, trading for Chicago Fire and Ghana national team winger David Accam. A 27-year-old with speed and finishing skill, Accam was with the Fire since 2015. He had 33 goals and 15 assists in that span, including 14 goals and eight assists in 2017. He has has played 10 times for Ghana dating to 2014. The Union spent a serious sum in the deal, sending Chicago $1.2 million in cash from Major League Soccer's allocation money system. And they will spend a consequential sum to pay him, as his salary last year was $820,937. 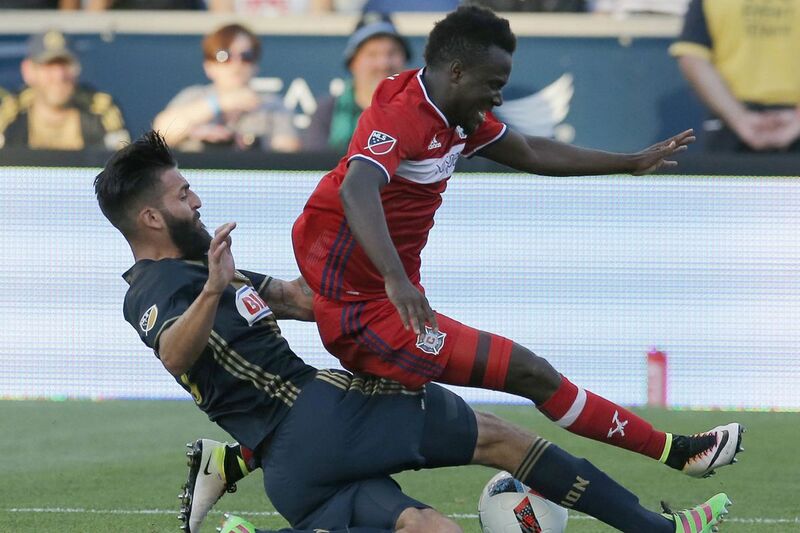 Accam will count as a Designated Player on the Union roster, the second of three they can have. Alejandro Bedoya is the other, and coincidentally, both players were teammates at Swedish club Helsingborgs in 2012 and 2013. Accam had wanted out of Chicago for much of this year. He reportedly asked for a trade in late July, and didn't get it. In recent weeks, the Union signaled they wanted him, and they got moving. "He's always been on our list" of targets, Union sporting director Earnie Stewart said. "We, as the Philadelphia Union, stretched ourselves to make sure that this type of player came aboard. So we're just very pleased overall that we were able to accomplish this." The phrase "stretched ourselves" was an interesting one. Spending $1.2 million counts as that by Union standards. It so happened, though, that Accam arrived on the same day that Atlanta United reportedly spent a MLS-record $15 million to acquire Argentine midfielder Ezequiel Barco. This deal, though, is one that has good value for the Union. Accam is a known quantity from his time in MLS, which kept the price reasonable and should help him integrate quickly with his new team. He also fits the bill from a public relations perspective, which the Union badly need. They've said throughout the offseason that they wanted to upgrade at winger, and they have fulfilled that promise. "I know there was some impatience with the timing of things," said Union manager Jim Curtin, who admitted at times last year that he was among the impatient. "This is a special player that we've added — one that changes the whole dynamic of our team and the soccer field, because he does have that pace to not only score goals and get assists, but also stretch our defense and give our midfield room to operate." Next on the Union's shopping list is a midfield playmaker. Stewart was coy about the search, saying he had no news and "even if there was, I wouldn't share that." Will there be high-profile shopping beyond those two roles? Likely not, Stewart said. He particularly refuted recent rumors linking the Union to international centerbacks. The team would rather give playing time to prospects like Auston Trusty, an academy product with high potential and expectations. "You have to give a pathway for those players to make important minutes," Stewart said. "We're going to have some players dive in, swim, and they're going to stay afloat. That's good."